Founded in 1934 and currently led by music director Alfred Savia, the Evansville Philharmonic Orchestra (EPO) is the largest arts employer in the region, supporting 80 full-time musicians from diverse backgrounds. Many of the musicians have graduated from the finest music schools in the country, including Indiana University and the University of Evansville. 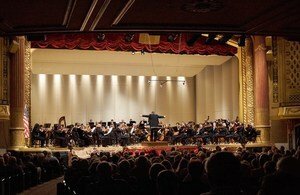 The Evansville Philharmonic Orchestra is committed to delivering exceptional music experiences that connect and strengthen the Evansville community. The Evansville Philharmonic highlights music as a legitimate pursuit that will enrich a person’s development, self-esteem, and ties to the community. THE EVANSVILLE PHILHARMONIC YOUTH ORCHESTRAS (EPYO & EPYO II) WILL PRESENT THEIR FALL CONCERT ON SATURDAY, MAY 11 AT 7:00 P.M. ON THE VICTORY THEATRE STAGE. EPYO II CONSISTS OF TRI-STATE STUDENTS IN GRADES 6-9, AND EPYO INCLUDES TRI-STATE STUDENTS IN GRADES 9-12. THIS PERFORMANCE IS THE LAST OPPORTUNITY THIS SEASON FOR THESE OUTSTANDING YOUNG PEOPLE TO SHOWCASE THEIR TALENTS.